First of all, of course, comes the question of a stove. Any ordinary cooking stove will answer all purposes; but if this is supplemented by a gas range, it will add greatly to the convenience. There should be a generous supply of water. A modern enameled sink will also aid very much, as this can be kept so clean that much of the work which would otherwise be done in pans or kettles may be done in it. A special dish-pan, kept for peeling; knives and spoons; a measuring cup; pots of different sizes, including one large one (five gallons or so), for syrup; a wire basket for straining; a colander; scales, and cloths for handling hot bottles and so forth, are among the essentials. To these, there may well be added, if more than a few cans are to be put up, most of the following: a saccharometer or sugar tester, which can be bought for about a dollar; a good cooking thermometer, suitable for use in hot liquids -(both of these can be obtained at most drugstores and the latter, especially, is quite essential); a jar-filling funnel; and a jar lifter. Fig. 31 - Lifter which can be made from a cake turner to lift jars and cans from sterilizer. Where much food is to be put up, a slicing machine will be found one of the most useful things that can be had. Of course, this will often be of use for ordinary purposes, and, if once tried, will be considered more of a necessity than a luxury. while an ordinary adjustable knife or sauerkraut slicer can be used, a rotary slicer will be found very much more effective, where a large quantity of potatoes are to be put up-and where they can be bought cheap in the fall-it will pay to dry them if there is not any method of storing them otherwise; and for this a potato-peeler may be used to great advantage. This, like the slicer, will be of use not only during the drying and canning season but throughout the year. Fig. 32 - Another type of jar lifter. Fig. 33 - Funnel for filling jars or cans. Fig. 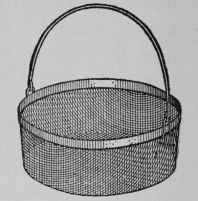 34 - Handy pail colander for dipping and blanching products before canning, also for removing glass jars from sterilizer.